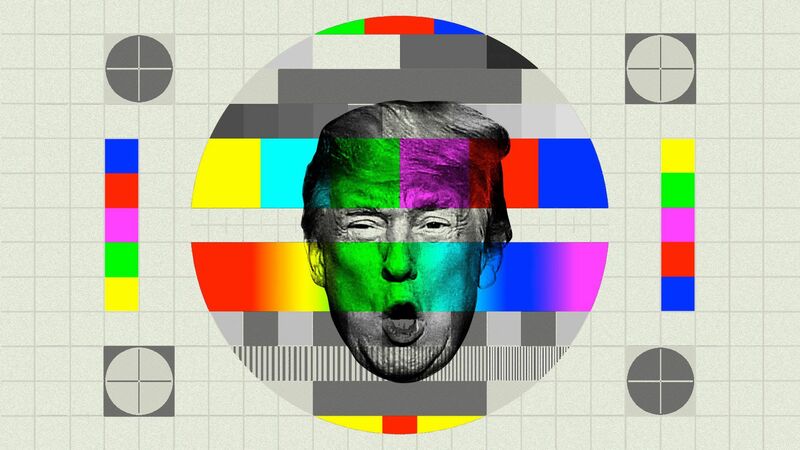 President Trump is finally fully merging his presidency with television, relishing the mounting amount of time that he's devoting to filling the airwaves — while also ravenously consuming his productions. The latest: Trump holds forth for an hour or more (much of it ad-libbed) at multiple campaign rallies each week, has added pregame and postgame shows with Fox News hosts to his repertoire, is blitzing Fox News more and more, and recently staged an impromptu "private Oval Office press conference" for New York Magazine. Yesterday, Trump reached peak TV with a wild, 47-minute call-in to "Fox & Friends," followed hours later by a raucous 25 minutes in the Oval Office with rapper Kanye West, who wore a red "Make America Great Again" cap. Trump has held more solo press conferences in the past month than he had in his first year. On Sunday, Trump will be on "60 Minutes," CNN's Brian Stelter reports. Even Fox News has had its fill, cutting back on its previous marathon live coverage of Trump's campaign rallies. That may account for part of the reason he's amped up his engagement. When Anthony Scaramucci joined the White House for an epic 10 days as communications director, he said he wanted to produce a daily show from the White House lawn. The White House is getting closer to that with his ever wilder and increasingly frequent free-for-alls with reporters. Why it matters: Trump has told plenty of associates about his single-minded fixation on the visual. He doesn't know details about policy, and doesn’t pretend to. Trump's top aides see the White House as the most valuable stage set in the world. Bill Shine, the former Fox News executive who this summer became deputy chief of staff for communications, wants to make better use of different elements of it — for instance, with more use of outdoor settings. The Trump team is out-Deavering the late Michael Deaver, the longtime aide to President Ronald Reagan who specialized in TV-friendly backdrops, including — as noted in the third paragraph of Deaver's New York Times obituary — staging the former actor "atop the Great Wall of China, at the cliffs of Normandy and filling sandbags to show concern after a Louisiana flood." West Wing aides have become extras in The Trump Show, with reporters pouncing on them with question as they arrive at the West Wing (unheard of in previous administrations), and cable news carrying the spectacle live. One of Trump’s favorite moments as president, according to a source close to him, was the day in February when he invited TV cameras into the Roosevelt Room to capture him negotiating about gun control for 64 minutes with Democratic and Republican lawmakers. The allegation that Saudi officials murdered Washington Post opinion writer Jamal Khashoggi. Trump has said little. Jared Kushner, who burnished the image of Saudi Crown Prince Mohammed bin Salman, has remained silent. Large legal clouds, including the Mueller investigation. Midterms that could radically change life inside the White House. Mounting national debts, and no prospect of the White House working with Congress to reverse them.